Sudden Infant Death Syndrome (SIDS) is defined as the unexplained death of a seemingly health baby during sleep during the first year of life. During the 1980’s, SIDS was occurring in approximately 130 out of 100 000 babies. Thankfully, by 2016, that numbers has dropped to 38 out of 100 000 infants. But it’s still a problem, and the problem is this: the diagnosis of SIDS is used simply because the events leading up to the death are unclear. There’s no diagnostic machinery that can conclude that SIDS has occurred. When a doctor or medical examiner can’t find a physical cause of death, they rule it as SIDS. While some cases are inexplicable, most are preventable. The truth is that most cases of SIDS are caused by unsafe sleep practices. Infants are put down to sleep in unsafe conditions and die as a result of suffocation. When we, as parents, are being told that babies can die suddenly, we are placed in a position of helplessness and led to believe that we can’t prevent it because we don’t know what causes it. As an example: in 1992 the American Association of Pediatricians (AAP) put forth a recommendation that babies be put down to sleep on their backs. From that year until now, the rate of SIDS has dropped by 50%. So it is glaringly clear that unsafe sleep practices are a major cause of SIDS. If we are all back-sleeping our children, why does SIDS still occur? Because we all aren’t. There is still a prevailing myth that back-sleeping increases the risk of babies choking on their own spit or spit-up. However, the AAP conducted a study proving that babies can, and will instinctively, turn their heads to protect their airways. Babies who sleep on their side or belly will have an easier time disposing of vomit or spit, but will also have an easier time rolling onto their faces and suffocating. Because an infant’s neck is not fully developed, it is easier for their head to turn while on their back than it is while they are lying face down. Practicing safe sleeping is so easy. Place your child to sleep on his or her back. Babies will reach a certain stage of growth and development when they will turn over on their own. If they are able to do so, then they can roll their bodies if their airways are blocked. Remove all blankets, pillows, stuffies and bumpers from the crib. If your baby manages to bury their face into these plushie items, they are at risk of suffocating. If your concerned about your little one being cold at night, place them in a sleep sack or tuck a loose knit blanket under the bottom of the crib mattress. Make sure the blanket only reaches to their armpits and cannot be pulled up. Do not bed-share with your child until they are at least 3 months of age. Until that time, babies should sleep in the same room in a crib or bassinet. Don’t rely on “smart” baby monitors. These monitors are designed to keep you updated on your baby’s vital signs and movements but they are not designed to prevent SIDS. Relying on them can potentially give you a false sense of security. 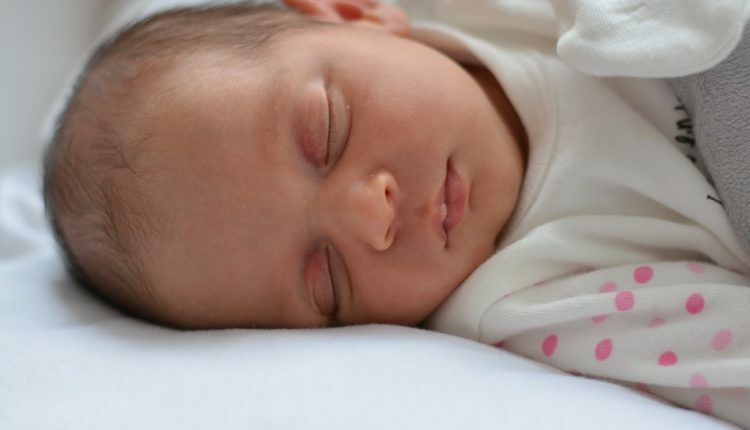 Will safe sleeping practices eliminate SIDS? Unfortunately, it is unlikely that creating a safe sleeping environment will completely eradicate SIDS. There are some genuine cases of infant death that are absolutely inexplicable. Some babies that die of SIDS have an abnormality in their brainstem that prevents them from recognizing that they are not receiving sufficient oxygen. Whereas if you or I had a blanket on our face and couldn’t breathe, we would instinctively remove the blanket. As of now, there is no diagnostic testing that can determine if a baby possesses this abnormality or not. To avoid the possibility of this occurrence, follow the recommendations above.